The bustards are a distinctive Old World family that diverged from cranes 70 million years ago. Some 24 species inhabit grassland or semi-deserts in Africa and Asia; a final species exists in grasslands of Australasia. The largest of them all is the Kori Bustard (left) of east and south Africa. Males (like this one) stand nearly four feet tall and can weigh up to 42 pounds (19 kg), making them among the heaviest flying birds on earth. Females are about 2/3 the height and 1/3 the weight of males in these large species. Males also give an impressive neck-ruffling display while giving a drum-like booming; they also possess a "balloon-type" display that turns the neck into a giant white puffball. This particularly Kori Bustard, however, is doing neither. He is reacting to the presence of a hunting Martial Eagle Polemaetus bellicosus, attempting to look both big and frightening, and to draw the eagle's attention from the young chick hidden in the grass nearby. I have always been very impressed with these huge birds, and have always wanted to see "the big three;" Kori in Africa, Australian Ardeotis australis, and the rare and endangered Great Indian Bustard A. nigriceps. It was satisfying to accomplish this goal with the final species in 2001. I have a page about all three "big bustards" elsewhere on this site, with photos of each and the story of finding the that most difficult one — the Great Indian Bustard. Two other large bustards are also threatened and would be a treat to see: Great Bustard Otis tarda (ranges locally and patchily from Spain and e. Europe to northeast China) and Arabian Bustard A. arabs (Sahel zone across n. Africa and sw. Arabian Peninsula). The remaining 20 species of bustards are half the size of the big bruisers, and some are even smaller than that. All, however, retain the distinctive bustard shape. Biochemical evidence affirms they are a homogeneous group; Collar (1996). Bustards apparently arose in Africa, and 21 species occur there now, 16 of which are purely Afrotropical. Several South African species have extensively black underparts, producing a very striking pattern as on this White-quilled Bustard (also known as "Northern Black Korhaan;" right) beautifully photographed by Greg W. Lasley in Etosha Nat'l Park, Namibia. Males of this and related species perform "balloon-type" displays in which some of the neck is expanded and other parts constricted, producing an outrageous "hourglass" shape. Some species also indulge in aerial displays. Bustards are very much birds of open country. They never use trees; indeed, they lack a hind toe that could grasp such a perch. They fly relatively little and in some seasons may go weeks without taking wing. According to Collar (1996), the "word bustard comes from the Latin avis and a lost Spanish word tarda, which does not mean 'slow' but is related to the English word 'tread,' and signifies walking; bustards are birds that walk, generally speaking at a deliberate, measured pace, although they commonly stand motionless for periods at a time." All bustards are omnivorous, eating whatever is in local abundance, from insects and lizards to green shoots and flowerheads. Despite the striking underparts or wing patches of some species, all the bustards are patterned above with beautiful camouflage washes or barring in browns and buff to protect them from aerial predators like hawks and falcons. Females are especially cryptic in their grassland habitat. Shown below are two east African species that illustrate this point: female Hartlaub's Bustard (below left) and a male White-bellied Bustard (below right). Although Africa has most of the bustards, there are two very interesting Indian species known as floricans. The Lesser Florican Sypheotides indica breeds with the monsoon on the central plateau grasslands of the Indian subcontinent, and then moves to the west for winter. It is now highly endangered, as is the Bengal Florican. This latter is an impressive bird that exists only in fragmentary wet grasslands on the border of Nepal and India, and in a virtually unknown tiny population is in Cambodia and adjacent Vietnam. Searching out the Bengal Florican was the primary bird target on a visit to Kaziranga National Park in Assam. We were fortunate to find two males in the habitat for Bengal Florican (shown below; with inset painting by Norman Arlott of the bird itself). This habitat is on Debeswari Island in the Brahmaputra River. The island floods entirely during the autumn monsoon, and dries out every spring and summer. Thus the island remains as wet grassland, rather than forest (you can see forest on the far side of the river in the photo above). This seasonally flooded grassland habitat is becoming increasingly scarce and now exists only in isolated patches, causing much concern for the future existence of the floricans — and other species that rely solely on this specialized habitat. Photos: The Kori Bustard Ardeotis kori was agitated by the eagle on the plains in Ngorongoro Crater, n. Tanzania, on 9 Aug 2002. Greg W. Lasley photographed the White-quilled Bustard Afrotis afraoides on 14 Oct 1998 in Etosha Nat'l Park, Namibia. 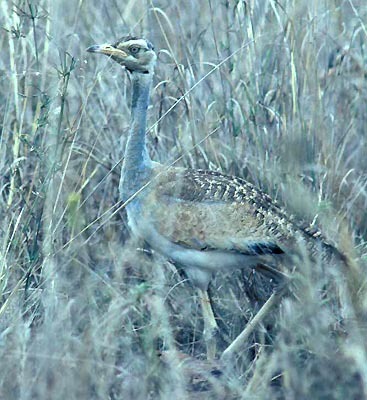 The female Hartlaub's Bustard Lissotis hartlaubii was in Ngorongoro Crater, Tanzania, on 8 Aug 2002; the White-bellied Bustard Eupodotis senegalensis was in Nairobi Nat'l Park, Kenya, in Nov 1981. The habitat of Bengal Florican Houbaropsis bengalensis was photographed in April 2002 on Debeswari Island in the Brahmaputra River, Kaziranga Nat'l Park, Assam, India, just after seeing one walking in right center (but it disappeared before I could get the camera out). The inset painting is by Norman Arlott from Rare Birds of the World (1988) by Guy Mountfort (Collins/ICBP). All photos © 2003 Don Roberson, except the Korhaan by Greg W. Lasley who holds that copyright and used with permission; all rights reserved. There is no "family book" of which I'm aware, but an excellent introduction to the family, with a set a very impressive photos, is in Collar (1996). As always with African species (or at least those in Africa), a very useful entrée into these birds is in Urban, Fry & Keith (1986). Urban, E.K., C.H. Fry, and G.S. Keith, eds. 1986. The Birds of Africa. Vol. 2. Academic Press, London & New York. Collar, N.J. 1996. Family Otididae (Bustards), pp. 240-273 in del Hoyo, J., Elliott, A., & Sargatal, J., eds. Handbook of the Birds of the World. Vol. 3. Lynx Edicions, Barcelona.